Rosie lives in an outback community in the Northern Territory with her mum. Adopted by the same local Yolnu family that adopted her father and her grandfather, Rosie’s early childhood is steeped in shared experiences of the land. Her indigenous sister or yapa, Nona, has long since moved away to be with her family. The story opens with Rosie in year 10, settled in life with a group of white teenage friends at the town school. Without warning Nona arrives to begin studying at the school. Clare Atkins opens up a world I could never otherwise imagine. She provides my first glimpse of the complexities of life in Yolnu culture, the reasons why white people might struggle to understand and the incredibly difficult decisions teenagers can be forced to make to belong. Set over the time of John Howard’s Intervention and Kevin Rudd’s Apology to all Indigenous Australians, Nona and Me explores death, life, falling in love, wanting to stay connected, hope and its loss—all in between the ordinariness of everyday life. Without sermonising or overwhelming me with information, Clare Atkins introduces me to Yolnu language and customs, the beauty of their connection to the land and the dilemmas that come with being an out-of-towner. 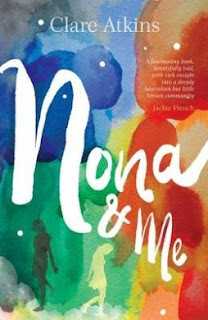 Nona and Me is a treasured classic that I will return to again and again.